This grilled peanut-free chicken satay tastes just like the Thai classic but without any peanuts. 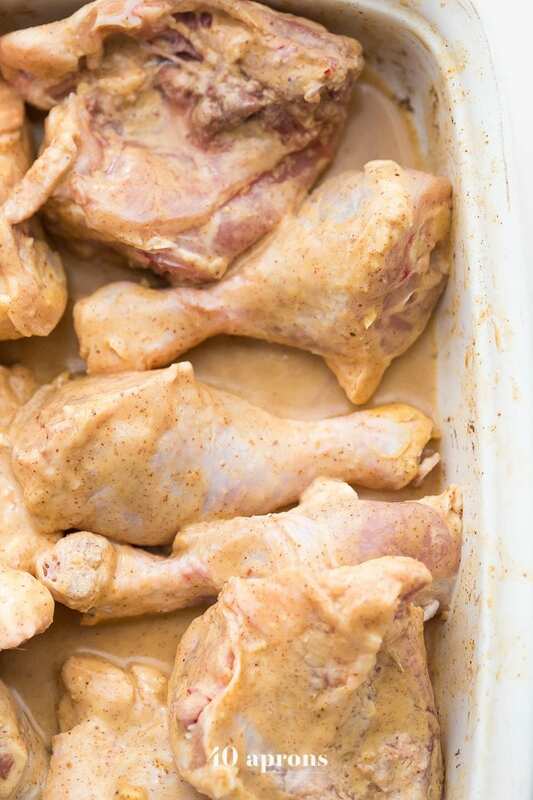 It comes together quickly and won’t heat up the kitchen, making this peanut-free chicken satay bound to be one of your favorite grilled paleo or grilled Whole30 recipes. 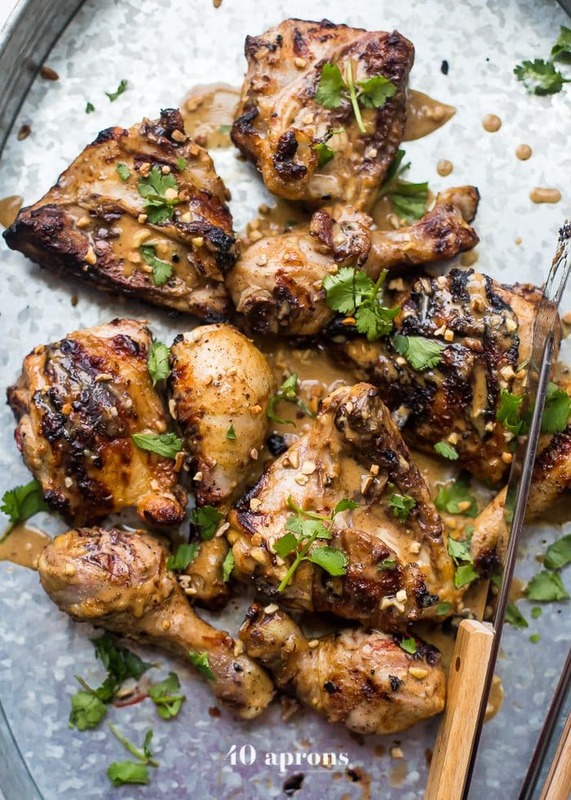 This peanut-free chicken satay is stinkin’ delicious! We didn’t eat exotic food growing up. Indian food, authentic Thai, and street tacos? Those were all foods I explored with my friends on the weekend. We weren’t spending each weekend at field parties, drinking Whatever Light, and sneaking in after curfew. No, we’d try a new curry house in town and leave haikus written on napkins for the servers. Then we’d dash to the park with our typewriters, belting Rogue Wave with the windows rolled down on the drive there. In the moment, it seemed new and interesting. In reality, there was nothing new about it, but it was new to me. Choosing dry-roasted fennel seeds and mango powder was a form of declaring independence: encouraging into my rotation flavors that I’d not been exposed to growing up felt like a deliberate expansion of my own personality, what I liked, and what I was tired of. I think it was this exploration, as I grew into my own person, is part of what prompted my love for cooking, the one that hit me suddenly and rang throughout every bone in my body like a tuning fork. I began to see things differently: “this is what I ate growing up” vs. “this is what someone halfway across the world ate growing up.” I’d make them both at home, in my tiny college kitchen with the dark brown carpet and the faux-wood countertops. I’d see the differences in our experiences as chance, as both life-altering and completely shallow. I had an active Recipezaar.com account—that’s what we called back then, before it became food.com—and I spent my free time searching for recipes to make after class or on the weekends before the field parties, drinking Whatever Light, not having to worry about curfew (or hangovers, back then). I even made a three-course Indian meal the night before an exam, rolling samosa dough and delicately frying the plumped triangles as the most foreshadowing procrastination I could muster. One of my all-time favorite recipes I found on the ‘zaar was for marinated chicken satay with a creamy, peanutty sauce. I adopted the recipe and made it my own, doubling the sauce, dialing up the salty fish sauce, transforming it into an anytime main course, rather than just a grilled appetizer. I made it over and over, using chicken breasts and serving them threaded on sticks at a party I threw for my editorial staff when I was the Editor of a literary magazine, marinating and broiling juicy chicken thighs for my future husband in his downtown apartment, grilling bone-in chicken breasts on our camping grill in the backyard of our first real home together. So when we went paleo, I missed peanut… a lot. I didn’t expect it, having braced myself only for withdrawals from popular paleo absentees: bread, ice cream, pizza, baguettes, rolls, popovers, waffles, pancakes…. Uh, did I mention gluten yet? But strangely, avoiding flour has been a bit more cut and dried for me, gluten being such a common omission these days. Peanut butter, on the other hand, felt like more of a gray area. We learned on our first Whole30 that legumes made us feel less than ideal, but peanut butter still felt like an acceptable side piece, an affair I wasn’t ready to end. And then it occurred to me one night that I could replicate the peanut butter flavor by layering peanutty flavors over peanut butter-like textures… Of course! Of course, of course. I was initially inspired to make a peanut butter fudge. I pulled together quite possibly the creamiest and best ever coconut oil fudge, stirring in plenty of creamy almond butter and a couple drops of sesame oil to mimic the peanut flavor. And it was delicious! It really was. It was aromatic, creamy, and rich, and I truly can’t wait to share the recipe for it. There was just enough delicate peanut flavor there for the sesame oil to not feel savory, but there was something about eating sesame oil in a fudge that I just couldn’t get over. I’d eaten sesame in desserts before, but it was almost always confined to pitch black Japanese desserts, creamy ice cream stuffed inside a gooey mochi. I wanted to want it; I did. But I just… didn’t. But it occurred to me that I could take this concept and apply it elsewhere, making a peanut-free chicken satay that works beautifully on the grill and makes plenty of sauce for dipping, drizzling, and sucking down with a straw. 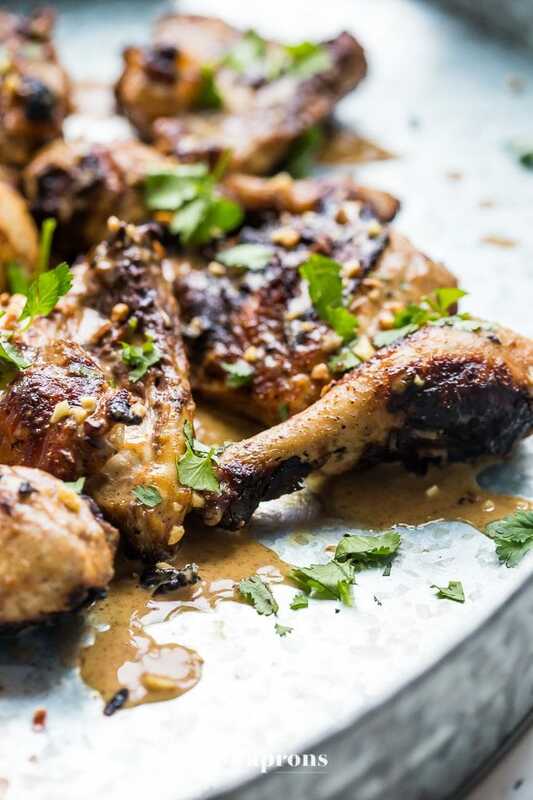 I combined all of the ingredients of my beloved chicken satay recipe, swapping out the peanut butter for almond butter and drizzling in a healthy amount of sesame oil to mimic that peanut butter flavor. And it was unbelievable. 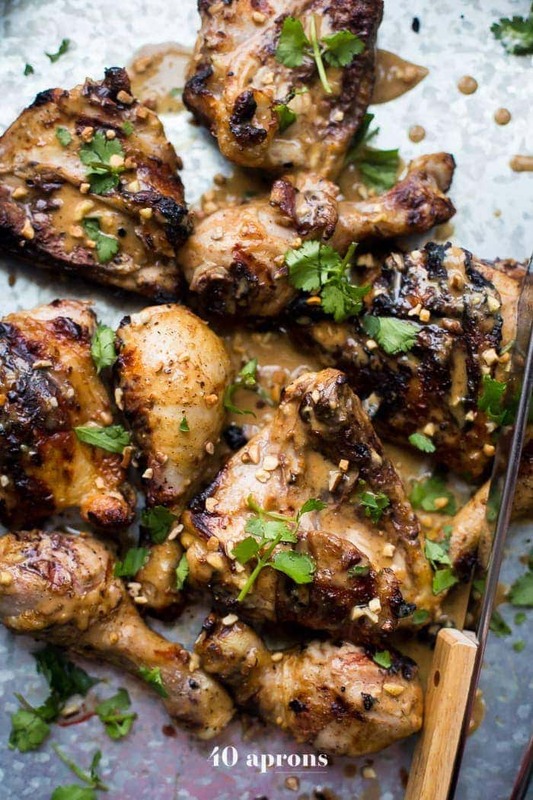 Peanut-free chicken satay that tastes just like the Thai classic. Seriously, though. 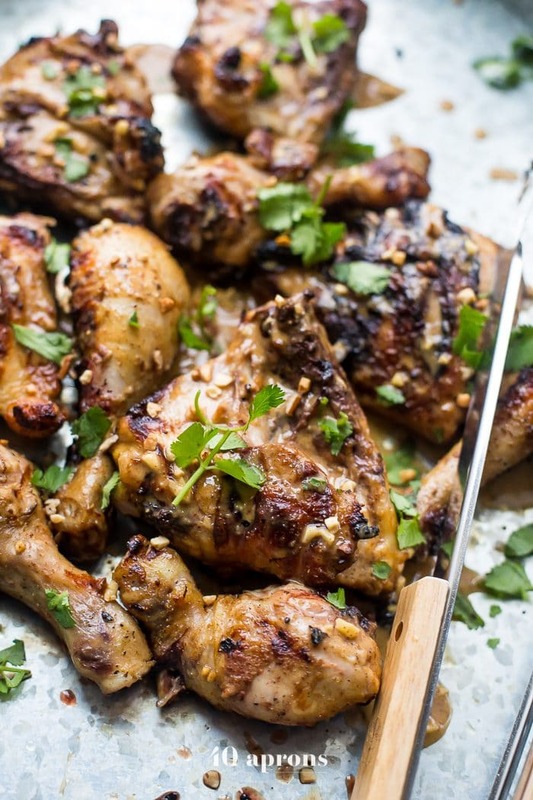 this peanut-free chicken satay is just so good. I highly, highly recommend an instant-read thermometer for this recipe. It will revolutionize how you cook your meat! Check out my suggested thermometer in the notes. Combine all marinade ingredients in a medium bowl and stir until smooth. Reserve 1 cup in an airtight container in the fridge until ready to serve. Place chicken pieces in a baking dish and cover with remaining marinade, turning to coat. Marinate at least 1 hour, up to overnight, turning at least once. Lightly oil grill surface and preheat grill to medium-high heat, about 400-450º F. Place chicken pieces on grill skin-side down and cook about 5-7 minutes or until skin is browned and does not stick to grate. Flip. If cooking boneless skinless chicken breasts, cook another 2-5 minutes until internal temperature reaches 160º. If cooking legs, cook another 5-7 minutes until internal temperature reaches 160º. If cooking thighs, continue cooking another 10-12 minutes, flipping as needed, until internal temperature reaches 160º. Remove chicken pieces from grill and let rest 5 minutes before serving. Serve with plenty of reserved marinade, fresh chopped cilantro, and chopped almonds, if desired. I recommend this instant-read thermometer. What sides would you recommend with this dish? Some rice or cauliflower rice + a cucumber salad would be great!